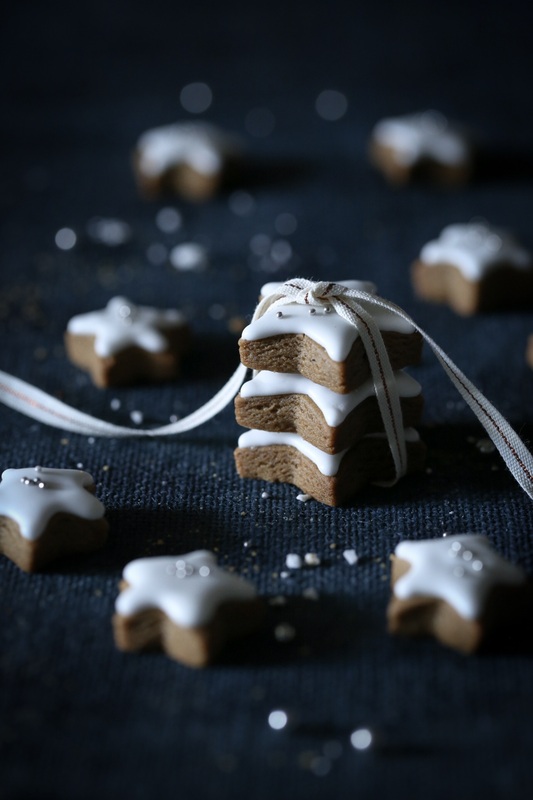 My favourite cookie of all time has to be classic gingerbread cookies. 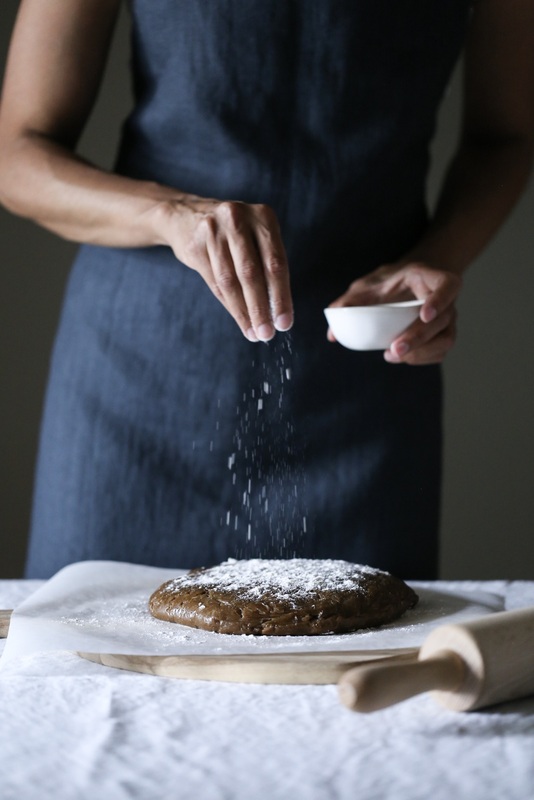 I’ve dabbled with so many recipes over the years, with varying success, sharing them with friends and family and adapting recipe after recipe until I finally developed one that I felt had the perfect balance of sugar and spice. That being said, everyone’s palate varies, so you may prefer to adjust the recipe to better cater to your taste – a little less or more spice perhaps, or substitute the lemon zest for orange zest for a slightly more bitter note, or the dark brown sugar for light brown sugar for a bit of extra sweetness. I also prefer to bake the cookies on the thicker side, so they stay crisp on the outside but slightly soft and chewy on the inside, but you may wish to roll your dough thinner if you prefer crispier cookies. 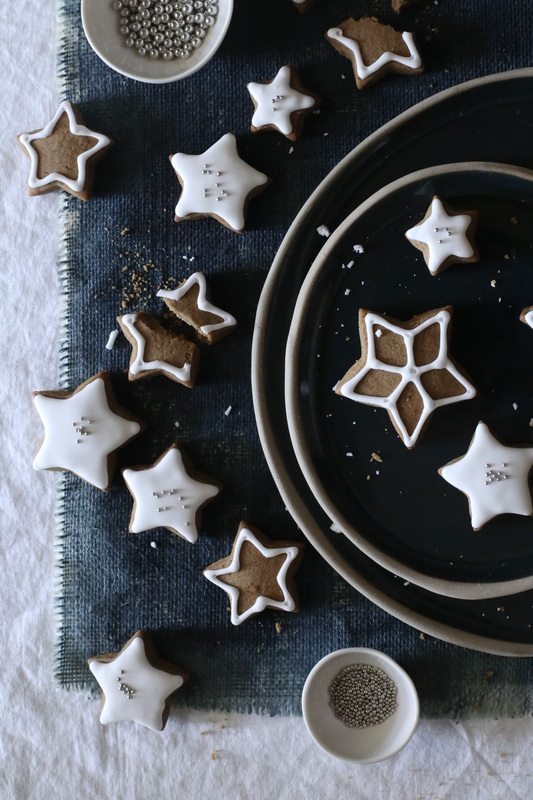 And don’t feel you need to reserve these cookies for Christmas. I bake them all year round, usually using a variety of cookie cutters to turn them into treats suitable for any occasion (one of my personal favourites – adorable onesie-shaped cookies make beautiful baby shower gifts!). They also can be used as decorations to create a gingerbread showstopper, for example, my Gingerbread Cake with Lime Curd and White Chocolate Frosting. (1) If this is your first time making cookies or you encounter any problems while baking, I would recommend referring to my post on Cookie Basics. (2) Using the freshest ground spices will ensure the most flavoursome (and the most aromatic!) gingerbread cookies around. (3) Please note that the number of cookies will vary greatly depending on how thick you roll out the dough and what size cookie cutter you use. 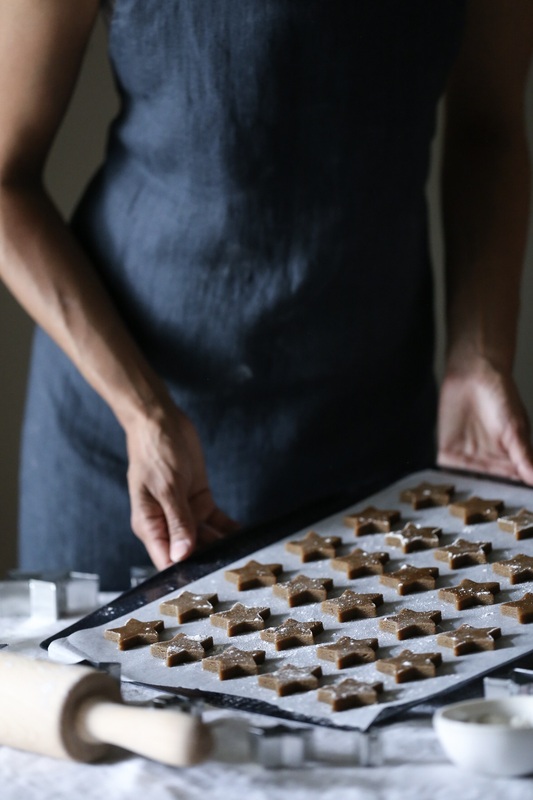 I usually roll out the dough out to approximately 7mm thick and use a medium-sized star cutter (4cm) to generate approximately 70 cookies. If you make gingerbread men though, for example, you may only yield about 30 cookies. Also, this recipe makes enough royal icing to outline some cookies, and completely fill or ‘flood’ others. If you wish to completely flood each cookie with icing, you will need to make 1.5 – 2x the icing recipe. (4) I love royal icing for gingerbread cookies, but it can be a little tricky to get it just right. My first recommendation would be to ensure you get the correct consistency. Traditionally, many bakers use two separate bags of icing with two separate consistencies, one thicker royal icing to sharply outline the cookie, and the other more fluid icing to fill or ‘flood’ the cookie with icing. I find it easier to use one bag with a consistency somewhere in between. The easiest way to check the icing consistency is by dropping a small blob of icing from a spoon into the bowl of icing and seeing how long it takes for the blob to disappear – if it takes about 15-20 seconds before you are left with is a flat smooth bowl of icing, then you’ve got the right consistency. These posts from The Barefoot Baker and Craftsy go into a bit more detail and are worth reading if you need further advice on the consistency of royal icing. Also ensure that you use a very fine nozzle fitted in your piping bag to pipe the icing. The nozzle ensures that you can easily direct the flow of icing, which I find difficult to do by just snipping off the end of the piping bag. Thirdly, I keep a toothpick handy in case I’m interrupted during piping. I place the toothpick in the nozzle to block the flow and prevent icing hardening and clogging the nozzle. Fourthly, if using decorations such as silver cachous, remember to start placing them on your cookies as they start to dry, otherwise they won’t stick. I find it easiest to pipe about 10-15 cookies at a time, stop to sprinkle them with cachous, then return to piping. (1) Sift flour, baking powder and spices together in a large bowl and set aside. (2) Melt butter, sugar and golden syrup together in a large saucepan, then bring to the boil. Remove saucepan from heat and add bicarbonate of soda with a gentle stir. The mixture will foam and become paler in colour. (3) Add fresh ginger, lemon zest and vanilla paste to butter and sugar mixture with another gentle stir. (4) Allow to cool for 5 minutes, then mix sifted dry ingredients into the butter and sugar mixture in small batches, then egg, until smooth. (5) Bring the dough together into a ball, it will be warm and very soft, but do not add any flour. Flatten the dough into a disc, cover in cling film and refrigerate for 30 minutes or overnight. (6) Preheat oven to 180°C (160°C fan-forced) and line a couple of baking trays with baking paper. (7) Unwrap the dough and roll to approx. 7mm thickness. Note if dough is left refrigerated overnight, it will need approx. 5-15 minutes out of the fridge to soften to a workable consistency before rolling. Cut out cookie shapes using cookie cutter and place on baking tray, approx. 5mm apart. Place baking tray in fridge for a couple of minutes, which will encourage the cookies to hold their shape when baked. (8) Bake in preheated oven for 7 minutes, or until very lightly golden and fragrant, and a small indent is left when pressed gently with a finger. (9) Transfer cookies to cooling rack and allow to cool completely. Continue process of rolling, cutting, refrigeration, baking and cooling until you have used up all the cookie dough. (1) Whisk egg white on low speed in stand mixer with whisk attachment, while adding sugar tablespoon by tablespoon until you are left with a thick white royal icing. (2) Add lemon essence, then add lemon juice drop by drop while continuing to whisk on low speed until you achieve the ideal piping consistency (see Baking Notes above). (1) Place lemon icing in a piping bag fitted with a very fine pinpoint nozzle (I use a metal nozzle with a 1mm tip). 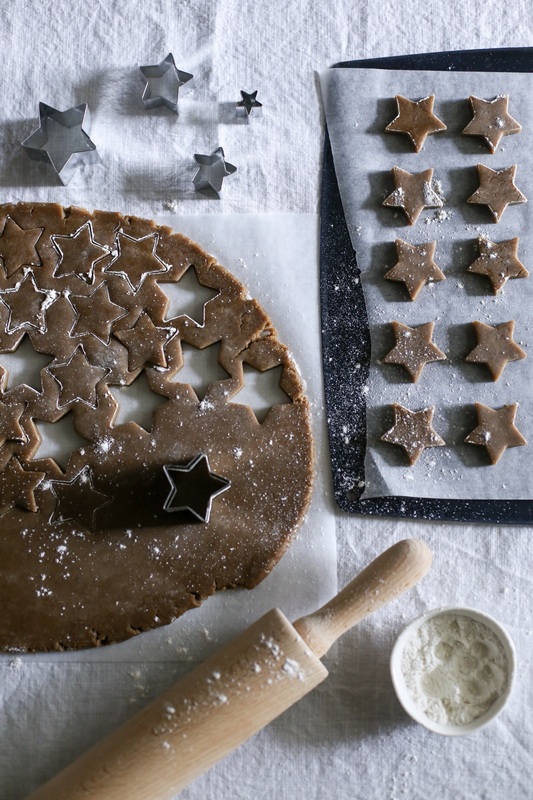 (2) Place a cookie on a non-slip surface or baking mat. Pipe the outline of the cookie shape, then fill or ‘flood’ the cookie surface with icing. If your icing is at the right consistency, you should notice a smooth surface of your cookie after approx. 15-20 seconds. Decorate with silver cachous and repeat icing and decorating each cookie until completion. (3) Ensure the royal icing has dried before packing cookies in an airtight container to maintain freshness. They will keep for 1-2 weeks in dry conditions.